After many years of riding at high end Hunter barns, I took a huge risk and opened my own place. 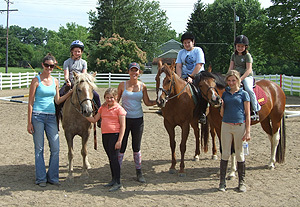 I wanted a place where students could learn safety and horsemanship, where we could help unwanted horses, and where people could really enjoy their equine friends. Fairy Tale Farm was born in January of 2009. Since our opening, we have grown a large lesson program, filled our stalls with boarders, and helped several slaughter-bound horses become valuable members of equine society. We also have earned important respect in our local show circuit, been invited it Breyerfest, and volunteered our time to a humane society case. While opening a barn of my own was a “fairy tale”, learning the day to day operations were anything but. That’s where SmartPak came in! Although we only house 14 horses, each gets numerous supplements and without the organization of SmartPak, we would be lost! SmartPak cuts down on the confusion of feeding time and saves us time as well. SmartPak made my transition into barn ownership much easier!